Alex Ito, Cloud Nine (2015). Exhibition view. Courtesy The Still House Group, New York. Alex Ito, 'After The Future' (2015). Install view. Courtesy The Still House Group, New York. Alex Ito, 'Movie and Dinner For Two (groupon)' (2015). Install view. Courtesy The Still House Group, New York. Alex Ito, 'Feast' (2015). Install view. Courtesy The Still House Group, New York. Alex Ito, 'Feast' (2015) Install view. Courtesy The Still House Group, New York. Alex Ito, 'Overwhelming Harted' (2015). Install view. Courtesy The Still House Group, New York. Alex Ito, 'Brunch' (2015). Install view. Courtesy The Still House Group, New York. Alex Ito, 'Grey Skies' (2015). Install view. Courtesy The Still House Group, New York. Alex Ito, 'Dark' (2015). Install view. Courtesy The Still House Group, New York. Alex Ito, 'Violence Violence' (2015). Install view. Courtesy The Still House Group, New York. Alex Ito, 'Pretty' (2015). Install view. Courtesy The Still House Group, New York. The Still House Group presented Cloud Nine, a solo exhibition by Alex Ito which ran from October 9 to November 6, 2015. The sculptural installation explored the undertone of utopian impulse and the complicated relationship between positivity and progress for the future. The exhibition is minimal and considered within a corporate aesthetic. The objects manage to make the atmosphere feel more hollow than an empty room, and the promise of success and joviality strips away the enchantment associated with the manufacturing of materials. Alex Ito, ‘Brunch’ (2015) Install view. Courtesy The Still House Group, New York. The sculptures are uninviting and lack any comfort for the body to inhabit. 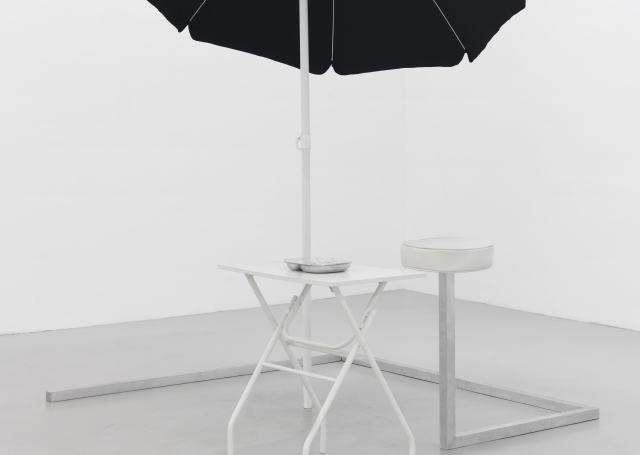 ‘Brunch’ (2015) combines a patio umbrella, a TV dinner table and a metal plate that could be found on an airplane, in jail or in the hospital. The stool is too high for the table and is held up by a welded aluminium structure. The metal acts as a support structure for a majority of the works. ‘Proposal (Three Day Weekend)’, (2015) places a miniature tree made of foam atop the welded material, becoming a maquette you might find in an architecture office. Alex Ito’s Cloud Nine was on at New York’s The Still House Group, running October 9 to November 6, 2015. Header image: Alex Ito, ‘Violence Violence’ (2015) Install view. Courtesy The Still House Group, New York.